Grammar: <emmer> [noun] [de emmer, de emmers]. You can turn "emmer" into a verb by adding -en. The verb "emmeren" translates to "to yack (on) / to whine (on)", and has a bit of a negative connotation. 1. "Hij had een emmer met warm water gevuld om de auto te wassen." 2. "Het regent alsof het met emmers uit de hemel gegooid wordt." 3. Frank zat weer enorm te emmeren tijdens de vergadering over dat ene puntje." 2. "Zeuren" : to nag / to whine, synonymous to "emmeren". "Dat is de druppel die de emmer doet overlopen! / dat is de druppel!" The Dutch news show on the public channels, a.k.a. the "NOS Journaal", once had an achorman called Fred Emmer. Fred Emmer was famous for never making a slip of the tongue and his very formal way of presenting. He left the NOS Journaal in 1988, but was never forgotten. During the celebration of the NOS Journaal 50th anniversary in 2006, Fred Emmer was notably absent. Invited though, he declined the honour. His reason: he didn’t want to look back… For some, Fred Emmer has a cult status. 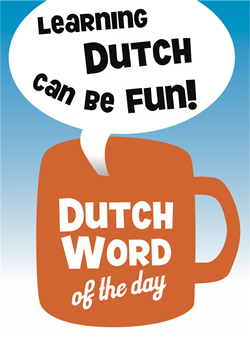 This entry was posted in Dutch word of the day, DWOTD 1.0, Vocabulary Basic and tagged emmer, emmeren by Dutch Gurus. Bookmark the permalink.